There’s no longer plenty of time. It’s almost October baseball and we are down to the final three games of the season. The magic number for the Yankees to play the American League Wild Card game at Yankee Stadium stands at one. Of course, the Yankees aren’t going to get off easy in these last three games, as for the sake of both the fans and the television ratings and just a good old fashioned rivalry, they have to play the Boston Red Sox, in Boston, one last time in the 2018 season. It’s not enough that the two teams have already met for five previous series’; oh no, let’s have one more for good luck, or something. But regardless of which team is the opposing team, these last three games are crucial, especially the first one. And as if the home field decision weren’t enough, it’s a bit of an audition for one J.A. Happ to see if he is the man for the starting pitcher job next Wednesday -- what with Masahiro Tanaka pitching his last regular season start earlier in the week against the Tampa Bay Rays. Additionally, it’s a good opportunity for Aaron Boone to see which offensive players are postseason-ready and can therefore make roster moves as necessary. Finally, depending upon how far both the Yankees and the Red Sox get into the postseason, this series serves as a bit of a “test run” for a potential meeting in just a few short weeks. Of late, the pitching matchups in this series have changed since their original announcement -- well, at least some of them have. Happ was originally scheduled to pitch on Saturday, and as of September 27th, he’s now scheduled to pitch on Friday, allowing him an extra day of rest before potentially pitching in the A.L. Wild Card game. Severino wasn’t announced as a pitcher at all in this series; now, he’s pitching the last game, potentially not allowing him enough rest before Wednesday’s Wild Card showdown. Is it possible -- perhaps even a foregone conclusion -- that Boone is giving us a clue as to the Wild Card starter in his changes in pitching for this series? If there was ever a big game for Happ over the course of his career in Pinstripes (however short) so far, this game would be the game. At least, until October 3rd. Potentially. 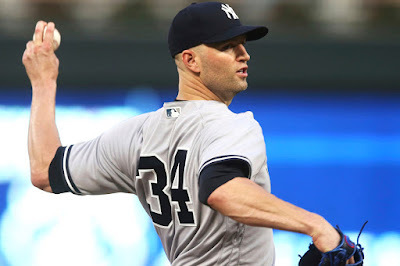 Happ’s consistency over flash tactics, along with the recent mediocre outings of both Tanaka and Severino, have moved him to the forefront of the Wild Card game starting pitcher conversation. And this game could seal the deal. His odds look good, as he heads into the series with a remarkable 0.78 ERA for the month of September so far. He’s logged no fewer than 5.0 IP in each game in September. He’s allowed 17 hits (HITS, not runs) over his five starts on the month. And while he wasn’t awarded the win in his September 18th start against the Red Sox, he didn’t allow so many runs that the Yankees’ offense couldn’t make up for it and win the game. He allowed one run. ONE. The pitching power definitely lies with the Yankees in this game, too. Brian Johnson faced a lot of movement in roles on the season, beginning as a starter, then being moved into a bullpen role, still getting an occasional start here and there and also battling an injury. And while that situation is unfortunate for him, it’s not unfortunate for the Yankees, who could potentially face a weaker Johnson in a starting pitching role that he’s not necessarily used to. However, that’s not to say that the Yankees’ offense should let its collective guard down; Johnson has appeared four times against the Yankees on the season, and while he allowed five runs as a starter, he did not allow a single run as a reliever. Disappointment is the buzzword surrounding Lynn. While his record was still a losing record prior to joining the Yankees at the trade deadline (7-8), it was almost even. Since coming to the Bronx, Lynn is 2-2; however, he started ten games. The remaining eight games ended in no decision for Lynn. That statistic is, if nothing else, inconsistent -- and doesn't make a good case for Lynn as a starting pitcher. At some point, over the course of those eight games, Lynn was removed from contention for the win even if the Yankees’ offense came back from behind to win the game. And while Lynn hasn’t faced the Red Sox since becoming a Yankee, he is 1-1 against the Red Sox on the season -- the loss being the more recent outing. There’s even more reason to be concerned about Lynn going into this very important game as his ERA just in September is 4.58. It’s apparent why Lynn hasn’t been in the Wild Card game starting pitcher conversation, but, it would be helpful if he found his form for this outing in Boston. UPDATE: Lynn ended up in a bullpen role during this game. But it seemed he fared far better there than he would have as a starter, going 3.0 IP in relief, allowing only two hits and one run, as well as earning the win. Domingo German started as an opener for the Yankees, going just 1.1 IP, allowing three hits and one run. Eovaldi, however, is not as easy to beat as it was assumed he’d be in the last Yankees/Red Sox get-together. His last start against the Yankees took place on September 18th, and while the Yankees won the game, Eovaldi was not charged with the loss. He went 6.0 IP, allowing just two Yankee hits and no Yankee runs. At that rate, the Yankees cannot look at Eovaldi as an easy win. There is, however, a metaphorical light at the end of the tunnel (or, at the end of a number of innings). In his last nine starts, Eovaldi’s numbers in terms of IP were on the low side; he went just 3.2 IP against the Toronto Blue Jays on September 11th, he went 3.1 IP against the Atlanta Braves on September 3rd and he went 2.0 IP against the Chicago White Sox on August 31st. 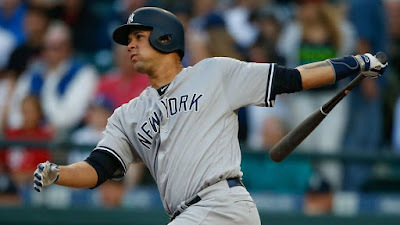 While his longer starts have, ironically, taken place against the Yankees (his aforementioned September 18th start as well as his August 4th start in which he went 8.0 IP), the Yankees offense was a bit quieter during those games, what with the absence of Didi Gregorius, Aaron Judge and Gary Sánchez. With the offense restored to a more formidable group, it’s possible all the Yankees will have to do against Eovaldi is play a waiting game. If they can’t hit him, keep the defense solid, wait for him to get the hook… and then, strike. Instead of Severino, Boone tapped Cessa for the Game 162 start. And he's a good choice to use in a game that, for all intents and purposes, "doesn't count." If he wants to improve his chances of staying out of Scranton-Wilkes Barre for an extended period of time, he can practice by gaining more MLB experience in games that have similar stakes to this one. Cessa's record and ERA in the starts he did land this year are not where they should be in order to be a regular in the Yankees' starting rotation; however, if he continues to develop his game, it's not beyond the realm of possibility that he could get a spot there in the future. The question that remains going into today's game is: is Cessa a starter or an opener? While Porcello touts an impressive record, at 17-7, his ERA leaves a little to be desired… but not much. He earned the win in his last start against the Yankees on August 3rd, and is 2-1 against the Yankees on the season. And he’s on a bit of a streak, too, picking up the win in two of his four September starts so far, and not being charged with the loss in the remaining two. So, to answer the obvious question: yes, the Yankees’ offense should be weary of Porcello. Gary Sánchez: Sánchez is due for a streak, as he hasn’t shown top offensive or defensive form since returning from his stint on the D.L. However, if his last two appearances are any indication from an offensive standpoint, the case can be made to say that he’s well on his way to that streak. Sánchez went 2-4 with a home run and four RBIs on September 25th, and he went 1-3 with a walk on September 26th, both against the Rays. He found his way to the bases, and if he keeps that up along with throwing in a big home run or two, Sánchez will be helpful both with big hits and situational offense over the course of this series. Xander Bogaerts: If anyone wants to have a conversation about hitters who have kept their numbers not just high, but consistently high, over the entirety of the 2018 season, Bogaerts needs to be in that conversation. Especially considering he missed almost an entire month of the season in April, his numbers are even more impressive. Bogaerts is hitting .333 just in the month of September, only to be rivaled by hitting .303 in August and .267 in July. He’s hit 22 home runs, stolen eight bases and logged 100 RBIs over the 2018 season. While his last appearance in a Yankees/Red Sox series was less than impressive, as he went just 1 for 11 and didn’t score any runs, he has still been a core contributor to the Red Sox offense. For that reason alone, he’s someone the Yankees need to be careful with.